Welcome to the Milken Alumni Network! 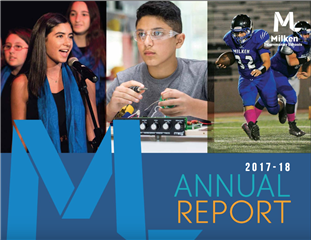 The Milken Alumni Association is made up of over 2,700 graduates around the world who are emerging leaders in the fields of business, tech, medicine, education, public service, the arts, fashion, law, and so many more. It is our goal to ensure that our alumni maintain strong connections to one another and to create opportunities for you to meet fellow alumni and expand your professional network. We host great events throughout the year and encourage alumni to visit campus for guest lectures and volunteer opportunities with our students. Be sure to read the monthly newsletter to stay updated on events, alumni news, and networking opportunities. Email or call Julie in the Alumni Office to update your email and to share news of your new job, a promotion, marriage or new baby! We love to share your accomplishments and exciting life events with the alumni network! Be sure to include your current contact information if you've recently updated your email or mailing address.